Reading and share top 13 famous quotes and sayings about College Sports by famous authors and people. 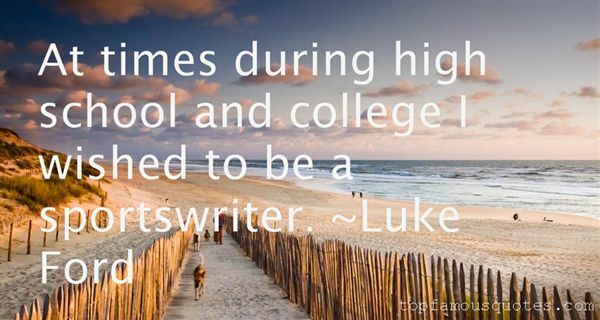 Browse top 13 famous quotes and sayings about College Sports by most favorite authors. 1. "I like sports. I'm a big football fan. When I was a kid, I was a... I don't even know how to describe it... I was an obsessed Brooklyn Dodgers fan. And I think when they left Brooklyn, which was simultaneous with me starting college, everything changed, and I haven't had the same passion for sports." 2. 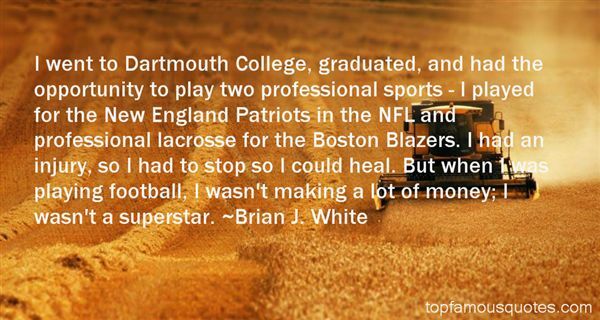 "I went to Dartmouth College, graduated, and had the opportunity to play two professional sports - I played for the New England Patriots in the NFL and professional lacrosse for the Boston Blazers. I had an injury, so I had to stop so I could heal. But when I was playing football, I wasn't making a lot of money; I wasn't a superstar." 3. "The American College of Sports Medicine found that the productivity of people after exercise was an average of 65 percent higher than those who did not exercise. If I have something that's really bothering me, so much that it almost hurts my head to try to sort it out, I always find the solution in a puddle of sweat! Intense exercise is like taking a magic pill that gives you the ability to solve problems like a superhero." 4. "I worked at a daycare for a couple of years going through high school and college. I did youth sports camps. I ran all the camps through my college." 5. "Believe it or not, I worked four summers in college as a sports writer covering baseball for a parks and rec department in Bayonne, N.J."
6. "I worked at my high school newspaper at Andover, which came out weekly, unusual for a high school paper. Then my first day at Penn I went right to the 'Daily Pennsylvanian' and pretty much spent most of my college career working both as the sports editor and then editor of the editorial page." 7. "Jocks were pretty much exempt from the standards that bound the rest of us. Teachers and administrators humor them because it's in everyone's interests to coax them through school and get them out of the building. Since it's unethical to turn them loose on society, they get sent to college to be kept out of the mix until their frontal lobes develop more fully. As enticement they are given sports scholarships that will later amount to nothing, not even good health." 8. "Academics often discount the value of top-rated sports programs in helping to develop a campus life and in contributing to the overall success of a college or university. Like it or not, the sports programs a college or university has are the front page of that university." 9. "Well, if I hadn't have been an actor I would have gone on to play college sports." 10. "Cheerleading gave me a love of sports, which I brought to the Senate. I can talk to the good ol' boys about college sports because I follow it like they do." 11. "At times during high school and college I wished to be a sportswriter." 12. "In student government in high school, I learned how to deal with people, and in college I studied Eastern philosophy. I'm also an avid team-sports fan. I think I just blended them all together and came out with a business management philosophy that combines the Eastern ethic with the Western sport concept, basically." 13. "Kay Cannon was a woman I'd known from the Chicago improv world. A beautiful, strong midwestern gal who had played lots of sports and run track in college, Kay had submitted a good writing sample, but I was more impressed by her athlete's approach to the world. She has a can-do attitude, a willingness to learn through practice, and she was comfortable being coached. Her success at the show is a testament to why all parents should make their daughters pursue team sports instead of pageants. Not that Kay couldn't win a beauty pageant - she could, as long as for the talent competition she could sing a karaoke version of ‘Redneck Woman' while shooting a Nerf rifle." I'm getting a girlfriend soon," said Michael in a serious tone, and everyone laughed. "You've got plenty of time for that, kiddo," said his father. "No need to rush. ""Well, I don't want a boyfriend, Daddy," said Madeline. "Boys are dirty, and they make a mess when they eat. ""I'd imagine the six-year-old ones would." Xavier chuckled. "But don't worry, they get better at it."